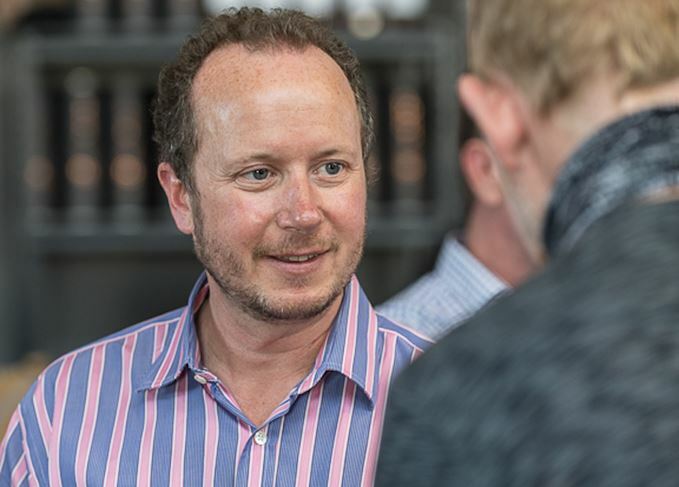 Alex Bruce is managing director of Adelphi, the independent bottler which also owns Ardnamurchan distillery on Scotland’s west coast. He talks to Dave Broom about his life in drink, blockchains, transparency and forgotten queens conceived in fireplaces. ‘There was definitely alcohol in the blood on both sides. On my mother’s side, my 4x great-grandfather was Andrew Usher Sr, who is credited with pioneering blended Scotch whisky. ‘My father [Lord Elgin], though not ever part of the industry as such, was instrumental in setting up the Keepers of the Quaich and has been a sort of tenuous global ambassador, but never more than really a kind of wheeled-out dignitary. My sister, who now works for Adelphi, was first at Pol Roger. We’re a fairly alcoholic family! ‘I had a lucky break. When I was at uni in the early ’90s, I had to do a third-year placement and got a post as a stageur in the marketing department for Rémy Martin. The intention was to write a dissertation on Scotch v Cognac, the conclusion of which was at that point Scotch was going down the flavour route and Cognac was going down packaging. ‘Whisky was still in the doldrums, so I was advised to get into the trade any way I could. I ended up with a job with J&B in their wine warehouse, and then on the road visiting hotels and restaurants across Scotland. ‘When J&B became part of Diageo, a few of us decided to go our own way and set up a Scottish office for another London wine merchant, Friarwood. When I went to Adelphi to try and buy some whisky for our shop, they offered me the job of running the company. At that point we had two casks and 300 bottles, and I was working from home on my own. ‘Adelphi bottlings have been described as ‘not being shy’. Obviously Charlie MacLean has been involved since the outset – we inherited him from [Adelphi’s previous owner] Jamie Walker – and he’s not shy. I’m not shy. ‘I think the easiest way to describe the Adelphi style is: “I’d want to have another dram.” It’s got to be nice, easy-to-drink and exciting. We don’t mind where it comes from or how old it is. It just has to have that flavour. ‘It used to be that that you’d go and take a sample from a cask or have a sample sent to you. Nowadays, I do find that if we are offered a parcel of decent names, I’ll buy the lot and then do the selection. Anything we don’t want we can use as trading stock. ‘The whisky loch of the ‘80s and ‘90s has more or less dried up and what’s left has premiumised in price significantly. Cask management in those days was also up and down, so you have to be selective. ‘Younger [post-2007] stock has better quality across the board, but is quite young, so there’s a gap in the middle. As a result, we don’t do very many bottlings! Over a year it will be one cask chosen out of every 35 offered. ‘As early as ‘07 we noticed that demand had overtaken supply, and there were three options: start filling new make, buy a distillery or build one. For some stupid reason we decided to take the third option! ‘Ardnamurchan is a small, remote place. It was obvious we should be as symbiotic with the estate as possible. That’s why we went down the route of using 100% biomass woodchip from local, sustainable forestry. A tractor and trailer delivers the wood, then takes the draff to feed the cattle. We are powered by the hydro from the river, which we also use for our water. ‘Food and drink is now Scotland’s biggest industry, but it relies on its own local, natural resources. I don’t agree with taking something out of the food chain. If you are going biomass, I don’t think you should be burning your draff – it should remain as a highly nutritional animal feed. ‘Because of what I do with Scotland Food & Drink [he is a director], I was fortunate to meet a team which had just come out of Entrepreneurial Spark [the Scottish innovation hub]. They had seen the possibility of adopting blockchain for food provenance and traceability, and thought that whisky might be part of that. ‘I thought the concept was great from a transparency point of view and, the more we looked at it, the more arms and legs came out of it. Blockchain gives the consumer transparency, and allows the manufacturer to monitor the supply chain. I can check there’s not parallel trading, for example. ‘Because we have to register every part of the process with HMRC, we will have everything detailed in the blockchain, from the barley in the field, through the process, into the warehouse. That then allows us to look at the casks we have chosen, and see the cool, or hot, or damp, or dry spots in the warehouse; when we have sampled it, if it has been re-racked, how many times the cask has been filled. ‘We are also working on technology for a chip in the closure, so when the bottle is opened, it will be logged into the blockchain. This could insure against bottles being refilled. ‘We all know that EU law states you can only publicise or promote the youngest age. My initial discussions have been around the meaning of the word “promotion”. I believe that blockchain is purely displaying the data which we have submitted to HMRC; therefore it is not promotion. The counter-argument is that if the consumer might be persuaded to buy another as a result of this, it counts as promotion. ‘We’ve scaled back on anything about age, but I am being allowed to show the vintage of harvest. It’s early days. ‘The Brisbane [Adelphi’s latest addition to its Fusion hybrid range, this time using Starward Australian whisky and Glen Garioch] is the first whisky to use blockchain. ‘The Fusion series is about wanting to celebrate Scots from the past who have been forgotten in their home country. There is nothing greater than tangibly bringing a character to life through something like Scotch whisky. ‘We worked with Hanyu for The Glover, celebrating Thomas Blake Glover, ‘The Scottish Samurai’; with Amrut for The Kincardine [aka E&K], while we partnered with Zuidam in the Netherlands on The Winter Queen, celebrating Elizabeth Stuart, Queen of Bohemia who, from her home in The Hague, kept Europe at peace in the 17th century. First release from remote west coast distillery is too young to be classified as whisky. The Winter Queen is a fusion of single malt from Scottish and Dutch distilleries. New releases will embrace Bitcoin’s blockchain technology in a bid to combat fake whisky. Young people in the Highlands are being given maturing casks to pay for higher education. Scotch whisky hybrids – friend or foe? Two divergent opinions on the attractions and perils of the rising tide of hybrid Scotch products.